Y’all know that I love love love unit studies! With our schedule so crazy with Ryan’s college classes, we just haven’t been able to do as many this year as we normally do. So…I was excited to be able to use a Once-a-Week Unit Study from Homeschool Legacy. They have numerous titles of unit studies, but the one we did was Christmas Comes to America which is all about Christmas! The weather had finally started cooling off when we started this, so it was perfect! I am not normally one to rush through fall, as it is my favorite season, but since this was school related, I figured it was ok. Plus, it gave us an excuse to start thinking about what we are going to do around Christmas! It is mentioned in the welcome letter that came with the downloadable PDF that this particular unit study is a little less intensive than other titles, because we all know how busy the holiday season is! I love that, because it is so true! And since we take the fall off school, it doesn’t feel like so much ‘school’ but more fun. One reason I love unit studies so much! Included is also a suggested schedule to work in your unit study. I would have loved to follow that, but with Ryan’s schedule, it just wasn’t possible. So, our biggest study days were on Wednesdays and Fridays, which was fine since that allowed us to have more time and we weren’t rushed. But it is a great schedule that is included and it allows time for fieldtrips and other excursions. The unit studies are geared to a wide variety of ages so the whole family can do them together. That is noticed in the book title lists.. There are some listed for non-readers as well as for kids that do read. Since it goes all the way up to grade 12, there is a large selection of books! It is very book intensive though, so make sure you follow the suggestions! It will let you know what is necessary vs what is a suggestion. There are also suggestions for books, videos and music. What I love about Homeschool Legacy is that their book lists are set up so that you can easily find these things in the library. 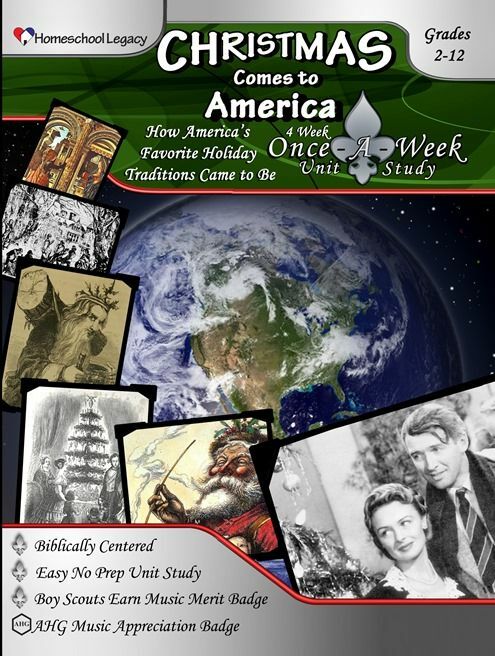 This Christmas Comes to America unit study is broken down into four weeks, four topics. The first one is The Dutch! This week talks about the origin of Santa Claus, so keep that in mind if you have little ones. There are Bible verses in the family devotional section for this week, a supply list, and it also suggests you start collecting Christmas Trivia for a family game at the end of the study. So many things are covered this week, History, Geography, Language, Traditions/Culture, Life Skills/Gift Giving, and music. There are also tips on research, fieldtrips and movie nights! Now, one of the activities this first week was to make hot chocolate and marshmallows for gifts! Totally a favorite with my kids. We usually just get pre-packaged hot chocolate, so this was fun. Even though it was made with Nesquik, it just had a more homemade flavor to it. The marshmallows we very interesting, I had always wanted to try to make some! We made an evening out of sampling it all outside…with some added muffins, because why not? Week two was The English, week three was The Germans, and week four was An American Christmas. All were very informative and full of activities to go along with that week! Towards the end of the unit study there are some extra trivia questions to add to the ones you collected so you could play the family trivia game. There are also some More Fun Christmas Ideas listed that will definitely put you in the Christmas spirit as they are all wonderful suggestions. Even with a ‘lightened’ unit study, there is still so much to learn in this Christmas themed one. All of the others are a little more in depth but with good reason! If you use any four life science or history-based unit studies will provide your students with the material necessary for a full course credit in those subjects. You can also earn Boy Scout and American Heritage Girl badge requirements doing these studies!